Tubulin polymerization using the fluorescence based tubulin polymerization assay (Cat. # BK011P). Tubulin was incubated alone (Control), with Paclitaxel or Vinblastine. Each condition was tested in duplicate. Polymerization was measured by excitation at 360 nm and emission at 420 nm. 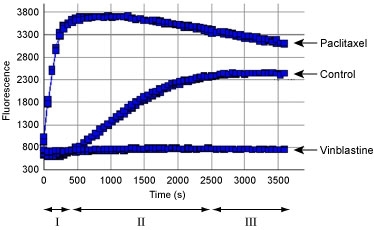 The three Phases of tubulin polymerization are marked for the control polymerization curve; I: nucleation, II: growth, III: steady state equillibrium. Burke et al. investigated the potential of tubulysin M, a potent tubulin binder and anti-mitotic tetrapeptide, as the cytotoxic component of antibody-drug conjugates (ADCs). Structurally, the C11 acetoxy moiety within the tubuvaline residue of tubulysins is important for their high potency. However, tubulysin activity is compromised when this moiety undergoes deacetylation. Replacement of this moiety with an ether or ester group created stabilized tubulysin M analogues. Wild-type tubulysin M and two stabilized analogues, both in free drug and conjugate form, were evaluated pre-clinically as anti-cancer therapeutics in in vitro and in vivo model systems. First, in vitro cell and biochemical potencies of the free forms of these tubulysins was determined. The free and conjugated forms were further evaluated using assorted cancer cell lines and in vivo tumor xenograft models, including those with multi-drug resistant phenotypes. Cytoskeleton Inc. produced sheep brain tubulin (Cat.# CS-T234S) in a specialized buffer for use in competitive fluorescence polarization tubulin binding assays to measure the biochemical potencies of tubulysin M and analogues in free drug form. These biochemical data complemented cell potency results and buttressed the rationale for further development and testing of stabilized tubulysins as a novel payload class for ADCs in targeted anti-cancer therapies. Burke P.J. et al. 2018. Glucuronide-linked antibody-tubulysin conjugates display activity in MDR+ and heterogeneous tumor models. Mol. Cancer Ther. 17, 1752-1760.